I found this online on a lazy Friday afternoon. I wasn't doing anything particular, just scrolling, reading, looking at pictures. And then this came up on the screen. I had to stop and just stare at it. The words came alive. I believe no one gives me the worst criticism than myself. I hate my chubbiness, I hate having to admit that I am not a young girl anymore. I hate not being as fair skinned as my sisters. I must learn to love myself even more. I must remember that I was created in the image of God, just like everybody else. My father used to tell me all the time that beauty is in the eye of the beholder. There's something beauty about everyone. Believe you are beautiful, say you are beautiful because you ARE beautiful! Thanks for sharing! Yes, you are! God looks at what's inside, man looks at what's outside. God knows what he created is BEAUTIFUL! This really hit home! Just yesterday I was saying to myself I need to love myself more. I want a prefect body but that doesn't exist. No one is perfect. I need to accept my flaws. You are beautiful! Thank you so much for sharing. I love this. It really makes you stop and think about how beauty is so much more than whats on the outside. What a wonderful poem, or thought. I really love it. And it's so true too. 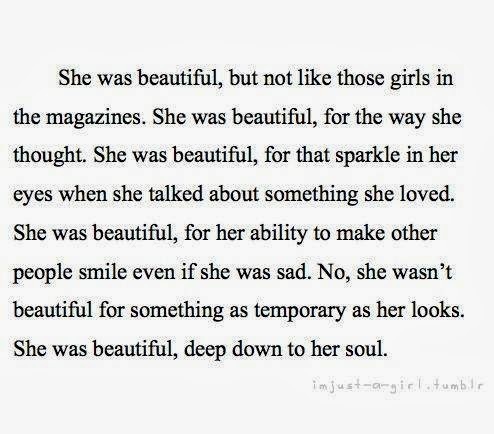 We are all beautiful, deep down in our souls.